Marathon gasoline is available through approximately 4,600 branded locations in 18 states in the Midwest and Southeast U.S. In addition to gasoline, these locations offer a wide range of services, from convenience store products to car washes to co-branded fast food to mechanical repairs and services. National Gift Card is the best place for you to order Marathon gift cards in bulk. We are the experts in all things gift cards and can set up your gift card solutions program for you today. Please contact us for more information on Marathon bulk, direct-to-recipient, or individual gift card fulfillment for your gift card program. Contact us here or call us at 888-472-8747 today! Card issued by MARATHON PREPAID CARD LLC. 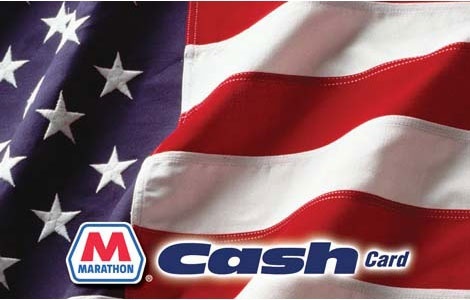 Card is redeemable for goods and services at participating Marathon locations. Card is not redeemable for lottery, money orders, or additional prepaid cards. Card may not be used to pay account balances of any kind including but not limited to house accounts and proprietary and third party credit cards, charge cards, fleet cards, or other payment devices endorsed or sponsored by Marathon Petroleum Company LP, its subsidiaries or affiliates from time to time. Card can be reloaded and will be honored only when activated via authorized means. Card is not redeemable or refundable for cash and lost or stolen cards will not be replaced.